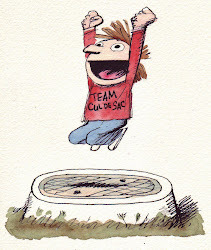 Meanwhile, Team Cul de Sac's money has flowed in and we're a mere $3,300 from meeting the goal... which reminds me, I owe some money to the campaign. "He Was a Good Man ... "
Richard Thompson of the strip 'Cul de Sac' battles Parkinson's. http://www.gocomics.com/working-daze/2012/08/04 - thanks to Doug Wise for the lead.